The Nokia 5700 became one of CellularOne’s hottest items in terms of sales. Speaking of which, it reveals that more and more people prefer mobile phones slash music and video player. Who doesn’t? Being able to turn you mobile phone to the ultimate companion during those long boring moments is one good thing. Twisting it to become the meanest sound wave conjurer is a better thing. Killing time has never been this entertaining. Of course, to enjoy the full features of the 5700, one needs to pair with the right mix of cell phone accessories. Accessories for sound, specifically. Having Bluetooth connection with this mobile phone means you get to share, load, and play music without the hassles of wire. Hook the 5700 with original Nokia Bluetooth headsets and speaker, as well as other Nokia accessories, voila! You got yourself a music entertainment central. As for the looks, interchangeable cell phone cases for the 5700 might be limited because of its unique twist design. But the stock case looks good enough, who needs to replace it? That said, the Nokia 5700’s performance as a phone is notable. CellularOne offers this mobile phone for as low as $205.99. That amount would seem sky high. But the benefits are worth it if you have some cash to spare. Otherwise, there are still good music phones out there that do not cost that much. I used to own a Motorola L6 from Cellular One once and I just have to say I had both good and bad times with this mobile phone. I just like the fact that it's not A RAZR, though there are similarities in their interface construction. Also, my L6 was given to me as a present, so there is what we call a 'sentimental value' attached to it. 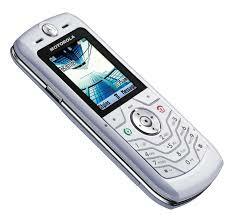 But sad to say, I had to part with my Motorola L6 when I need to upgrade to an advanced mobile phone. I really had a hard time packing up all those Motorola cell phone accessories I have purchased throughout my time with my L6. I had customized cell phone cases of different designs and a couple of cell phone batteries I bought when my L6 accidentally fell to the floor. I did have my share of signal nightmares where I have to get to the roof in order for me to catch some reception. Sure, I miss my L6. But life has got to go on, right?